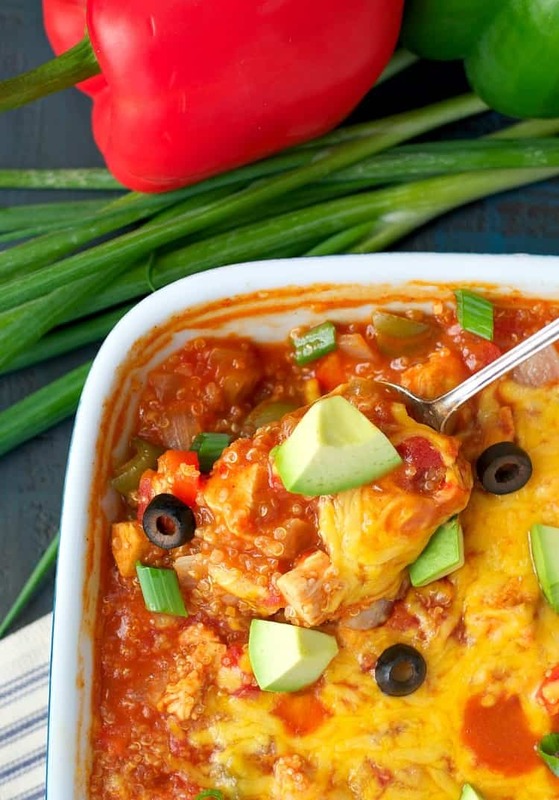 This chicken fajita bake with quinoa is bursting with Mexican inspired flavors. It's filled with lean, protein, veggies and quinoa making it super easy to get a healthy meal on the table! 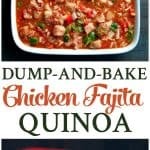 This Dump and Bake Chicken Fajita Quinoa is full of familiar Mexican-inspired flavors that your family will love, but it’s also loaded with plenty of veggies, lean protein, and whole grains for a nutritious supper! 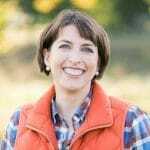 If you’re a mom (at any stage in life), then you’re probably familiar with that little thing that we affectionately call, “Mommy Guilt.” You know, that pit in your stomach after you lose your temper and yell at your child? The shame that comes from those evenings of utter exhaustion when you opt for the drive-thru in lieu of an Instagram-worthy dinner of quinoa, kale, and kombucha? Or that voice in your ear that says you’re never enough…you shouldn’t work so hard/be away from the home so much/have your own interests, WHATEVER?! Well guess what…that has GOT to stop. Because you are enough, you are a good mom, and at the end of the day, we’re all just doing the best that we can. Let’s end the judgment, the self-critique, the comparison, and the Mommy Guilt. There’s no place for it! If your child knows that he’s loved, then you are AWESOME. If your partner feels appreciated, then you’re doing something right! And on the off chance that you’re having one of those evenings where the burger joint is calling your name, you can either swing right through and not give it a second thought (no problem with that! 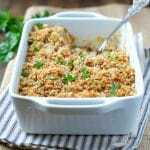 ), or you can pull together these simple ingredients and toss an easy dump-and-bake quinoa casserole into the oven. I’m pretty sure that this meal comes together as quickly as a Happy Meal! a dinner masterpiece! It’s full of familiar Mexican-inspired flavors that your family will love, but it’s also loaded with plenty of veggies, lean protein, and whole grains for a nutritious supper. The best of all worlds. My boys seriously devoured multiple servings of this particular dinner! While the quinoa cooks in the oven, you can go ahead and pour yourself a glass of wine, call a friend, paint your nails, or read a magazine. Take a shower alone (gasp! ), shop online, or pursue that hobby that you’ve been itching to start. Whatever you decide to do, please don’t give dinner a second thought. There’s no room in your life for Mommy Guilt, and in the end…your kids are eating quinoa! I’d say that’s a WIN. The great thing about this dish is that it’s super comforting and delicious but also really healthy! By swapping the carbs in the tortillas for quinoa totally transforms this easy bake. You won’t hear any complaints and you can relax knowing a healthy and nutritious meal has been served for dinner. Cooking for Only 2? Cut the recipe ingredients in half and bake in an 8-inch or 9-inch square dish. Want to prep ahead? You can assemble the dish in advance, cover it, and keep it in the refrigerator until you’re ready to bake! 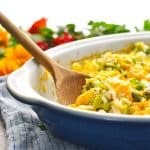 Adding Cheese – If you’d like to top the dish with shredded cheese, just sprinkle about ½ cup cheese over top of the dish once it’s finished baking. Place the dish back in the oven (uncovered) for about 3-5 minutes, or until the cheese melts. 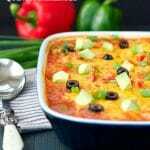 Freezing – This chicken fajita bake can be frozen. Just store in suitable containers before cooking, defrost and bake. Preheat oven to 375F (190C). Spray a 13x9-inch baking dish with cooking spray. 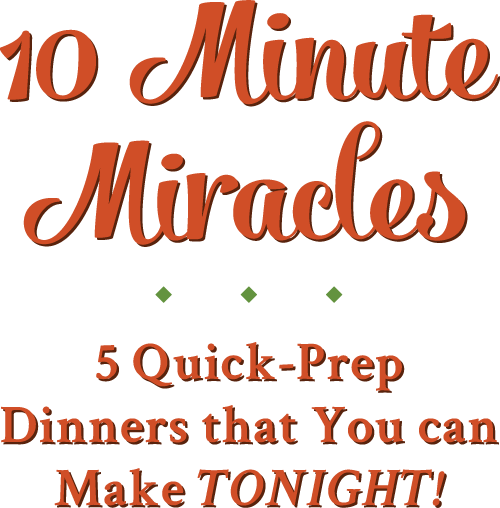 Previous Post: « Stock Your Pantry: 10 Ingredients for 8 Easy Weeknight Dinners! You always kill it with the yummy dump and bake dinners! Chicken fajitas + quinoa is not only a tasty combo, but all the ingredients are full of nutrients! I don’t have mom guilt but I do have wife guilt of working too hard during the day by recipe testing, that I have no energy to make dinner! My husband is a good trooper, though! 🙂 I could definitely muster up the courage to make this dish, though. It looks amazing, Blair! I love the quinoa and chicken fajita flavors! Blair… your posts are so inspiring. I love reading it. I know all about mom guilt, I know exactly what you talking about here. I’m always trying to do my best as a mom, as a wife. Somedays I feel like I’ve done the job right and some days I feel like complete failure. Luckily I have my husband who encourages me greatly. He helps me a lot. We actually help each other out. We give our bests together! And I feel great at the end of the day when I know that I served my family a good healthy and nutritious meal. 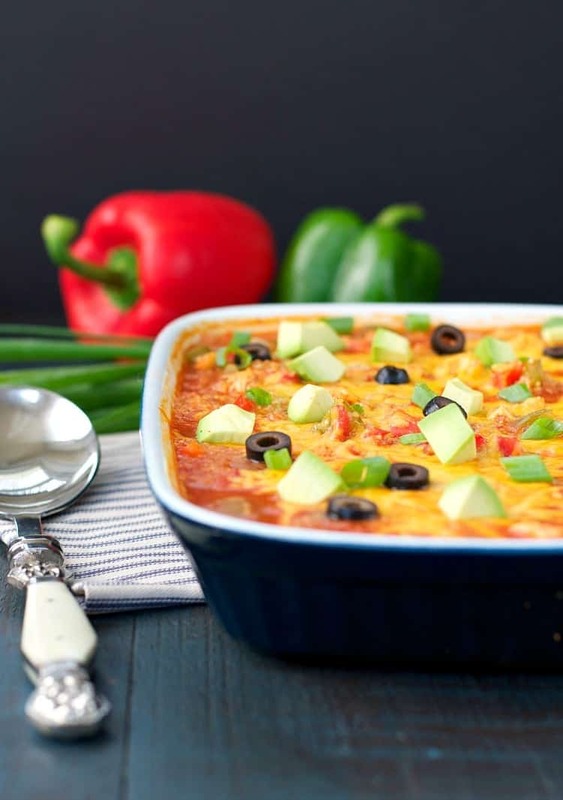 Like this quinoa bake… not only that it looks really delicious, it’s also very healthy. And bonus – it’s EASY to make! Perfect for busy mums right 😉 Love this recipe Blair! Sharing and pinning! Have a lovely weekend! Oooh! This looks amazing! I love that you don’t have cook anything in advance too – just throw it all in! Thanks, Kristy! It’s definitely about as easy as it gets! Another winner that reheats well! I am so glad I stumbled over your site via Pinterest. I like to cook 2 or 3 meals on Sunday and reheat them on weeknights instead or doing it from scratch then. It allows for more elaborate and healthy meals even when we come home late. I put on the table all the toppings we would use in fajitas or tacos (salsa, cheese, guacamole, olives, fresh tomatoes, lettuce and sour cream) and we each topped our bowls as we liked. Great success. This sounds amazing & I can’t wait to try it, but I’m not sure what taco sauce is…is there a good substitution if I can’t find it? Hey, Kelly! Salsa is a good substitute for taco sauce. Taco sauce is basically salsa — minus the chunks. So it’s a smooth sauce that my kids prefer over salsa. I buy the mild version so that it’s not too spicy for the little ones, too. I would prefer taco sauce in this recipe because it’s more liquidy than salsa, but if you can’t find it then just go with a relatively smooth salsa! This was soooo good! The quinoa reminded me of Mexican rice. So yummy and so easy. I will definitely be making it again, and I might even try adding more veggies. Thank you! 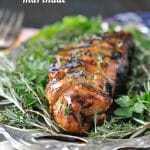 I always see incredible recipes like this in different blogs and almost every time I wanna try them all. But almost every single time too, I can’t find at least one of the main ingredients. Is so sad. In this case is the Taco sauce, I don’t even know what that is. Or not exactly. I mean, I know how to make a regular sauce for tacos (for example, tomatos, onion, some garlic, chile, etc.) but I think you are talking about an specific sauce that one can buy in the supermarket. Same with the fajita seasoning. Is there any possibility to reemplace those elements? Or make them myself? Please say yes. Hi, Fernanda! THe taco sauce that I use is made by Old El Paso, but there are other brands available as well. Taco sauce is basically salsa without the chunks. 🙂 My kids prefer the smoother consistency, but you can certainly use your favorite homemade salsa and just puree it so that it’s not too thick and chunky. As far as fajita seasoning goes, I use the packets for convenience, but if you want to make your own, there are a lot of recipes for homemade fajita (or taco) seasoning online that you can substitute. Hope that helps! Awesome recipe! I’m a little concerned with the high sodium content though which seems to come mostly from the salsa. I’m wondering if there is a way for me to halve the amount of salsa used and replace with something else that is a bit healthier while maintaining the flavor. Any suggestions? Hello! I am wondering if I could do the same thing but with uncooked rice? Would it turn out the same? Thanks and looks so good!! Hey, Amanda! Yes, it should work equally well with uncooked rice. Keep the measurements the same, and just check the rice after 45 minutes. It might be done at that point. If you’re using brown rice, you’ll need extra time (more like 60-75 minutes). Enjoy! I love the sound of this recipe! Just wondering, do you think this can be frozen to be reheated as a work lunch too? Hi Blair…would i be able to substitute rice for the quinoa? 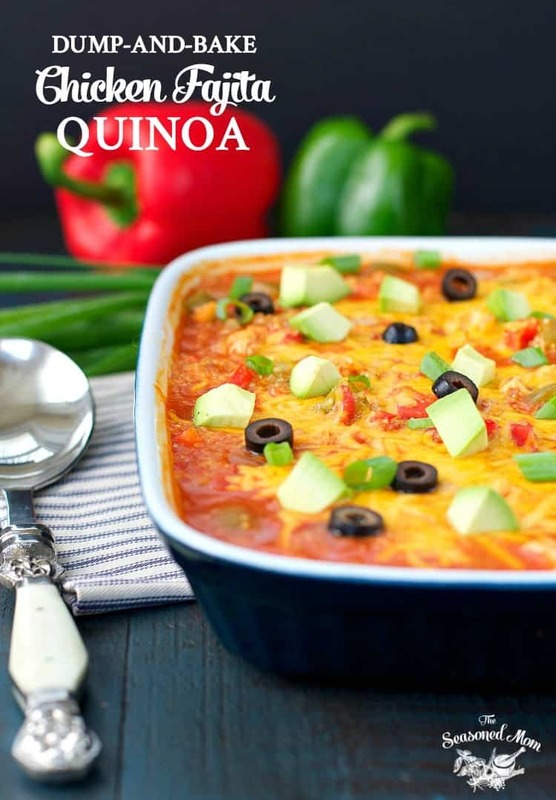 Recipe sounds amazing..i.ask because quinoa is healthier but tends to be a bit pricy at the store. Hi, Teresa! Yes, it should work perfectly with regular long grain white rice. If you use brown rice, it will require a longer cooking time. I don’t recommend instant rice because you would have to adjust both cooking time and liquid proportions for that difference. Thanks for the prompt reply😊😊ok great! Can i use my crockpot to cook this? Hi, Teresa! Yes! I definitely think that it would work well in the slow cooker. I’ve never tried it that way myself, though, so I can’t give you an exact cooking time. I’d try it on LOW for about 6 hours, and just check it until the quinoa is tender. It may be ready sooner, but it also might take a little longer. Enjoy! This looks delicious! 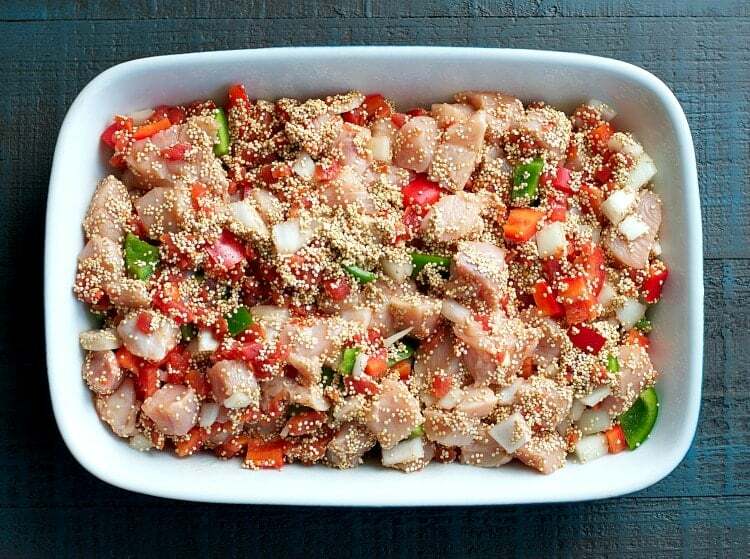 Since quinoa is already a complete protein, do you think this dish would work without chicken? 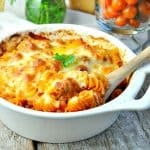 I love the quick prep of this casserole but would prefer it to be vegetarian. Thanks! Hi! Can I make this with uncooked Cous Cous instead of the Quinoa? Hi, Natascha! No, I don’t think so. I haven’t tested it with cous cous, but since cous cous has a very different cooking time and absorbs a different amount of liquid than quinoa, it will definitely turn out differently. This was delicious!! Whole family raved about it and I feel good serving then healthy food. Can’t wait to try different combinations to play with the flavors. We have all kinds of “sauce starters” at the grocery store, I feel like the possibilities are endless! 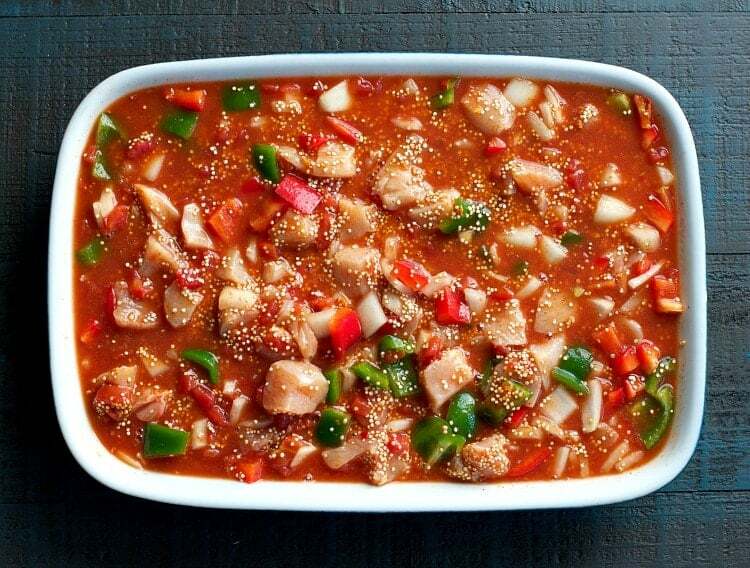 Thanks for making quinoa approachable, easy & delicious! !